The Social Media Bundle extension places ‘Facebook Like’ and ‘Follow’ buttons on any page of a website, thus integrating your Magento store with Facebook. By clicking on the ‘Like’ button, the extension automatically places the product image and name on the user’s Facebook wall. Visitors get the possibility to promote your shop within Facebook community leaving comments on store items and involving their friends into a discussion. The extension adds Facebook Connect button to login and checkout pages enabling users to access your store and their accounts in just a few clicks. The Magento account will be created automatically. The module equips your visitor with one click registration and login to Magento with their Twitter profile. Users do not have to fill in long registration forms. All they have to do is enter their email address to Magento profile. The ‘Tweet’ button encourages customers to share store content on Twitter and highlight products they like with their friends. The ‘Follow’ button is aimed to increase the quantity of your Twitter account followers and keep them informed about store news. The counter added to this button displays the total quantity of followers. Add the Google +1 button on any page of your store and make it stand out in Google search results. Google Connector automatically creates Magento accounts for Google+ users and the ‘Google Share’ button assists customers in sharing their shopping experience and promoting products within Google+ community. 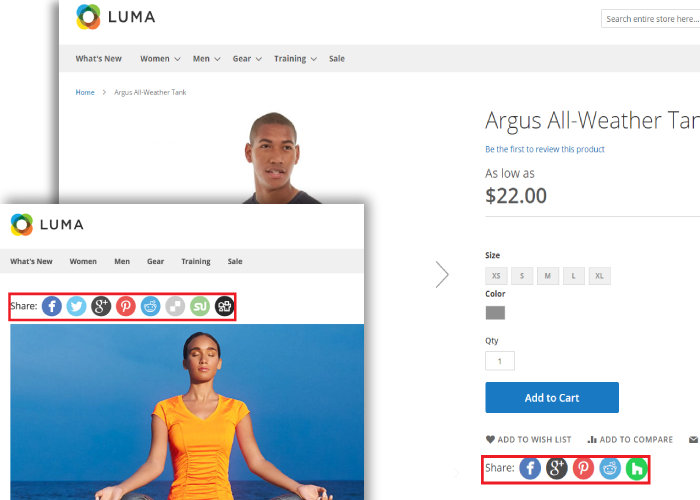 The ‘Pin’ button added by the Social Media Bundle module helps grabbing an image, price and product description from a Magento site and adding it to one of the Pinterest boards. This would be great if you can add whatsapp and it appears for mobile accordingly. I love this add on - I think it just tips the balance in offering a way of logging in on your website that competitors may not. Anything that makes the login easier is fantastic as far as I'm concerned. Excellent support from the installation team. I had a couple of queries which they reacted to really quickly and fixed for me. Allow social sharing in your Magento 2 store to involve customers in the promotion activity. Our life has become so hectic people literally have no time to look at things around them. Then how can a merchant attract newcomers to a store? How can one satisfy the needs others still don’t realize themselves? The answer is effective promotions. And the potential of advertising on social media is unlimited as everyone uses social media today ― again, to save time on communication. Become visible in the blink of an eye! Allow customers to share their experience at your store on social media! Let them speak about your impeccable services and be heard by the whole world! These are the offers of the Share Buttons extension for Magento 2! The built-in services allow customers to share any product or blog pages. Thus, your store is actively promoted without efforts from your side. Create tempting offers and see how customers react to them. Make it easy to promote outside your store and attract a new audience. Place the social widget anywhere within a page. 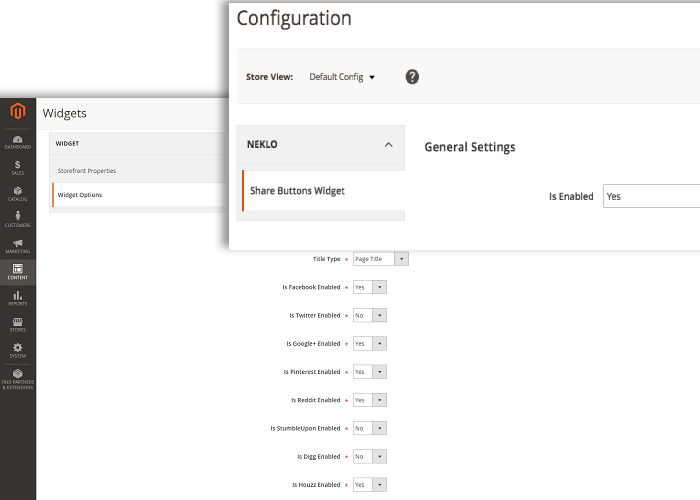 Make it visible with the configurable layout. Provide easy access to any social service as the buttons open a link in a new window. How does the Magento 2 Social Share Buttons extension beat the competition?